This is another simple, easy one pot meal that we tend to come up with during the week when we are all busy with work and other school day activities. In a skillet, heat oil and saute’ onions and garlic until fragrant. Add the rice mixture and stir in the oil for a minute or two. Season with salt & pepper. 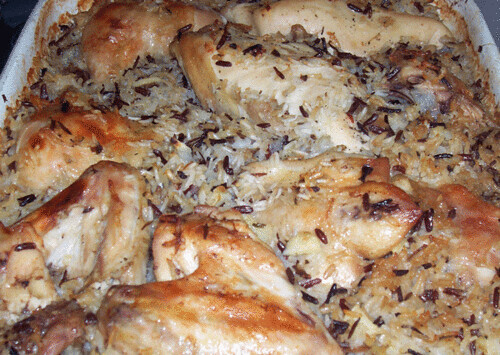 Pour the sauteed rice mixture into a baking dish and layer the chicken pieces on top of the rice. Season the chicken pieces additionally with salt & pepper. Add the chicken broth to the pot and cover with a lid if it has one or with aluminum foil. Bake in the oven for 1 and 1/2 hours at 350 degrees F. Check after an hour in the oven to make sure it hasn’t dried out. If it seems a bit dry, add more liquid. Here is a quick and easy weekday dinner, serve with vegetables of your choice. Yummmm. I love easy bake dishes…I’ll send you a recipe I just tried this evening. I know the girls will love it. JAG and GG did. Wow that looks yummy and easy (or is it). Glad to find your site. Saw another post about adobo also . Will check that out. This looks delish and so easy to prepare ha! My husby might be interested to try this (with chicken breasts, of course). I think I will add the brocolli into the pan embedded within the rice grains (hubby likes them really cooked anyway). D’ya think that will be fine? BTW, I am trying to upgrade my online kusina (sinasabayan ang real-life kitchen-building). Hi dexie! yes, baked dishes are perfect for busy moms like us. Hi Watson, wild rice is actually not a rice but rather a week. Siya yung maitim na mahaba dun sa pic. Pwede lahat yung rice na binangit mo, lalo na ang brown or red rice. Hi Jules! good to see you back, I guess you’ve been busy with school, huh? Let me know how it turns out for you. Hi mel, yes, you can use white rice. Wild rice is actually not rice. I’ll do a bit of research and post what it is here. This is interesting! Seems so simple to make. Can we use white rice instead of wild rice? What’s with wild rice? I will try this one this weekend. Oh my GAWD!!! that looks so good but it’s 11:00 PM here and I really should restrain myself from cooking a big meal right now. 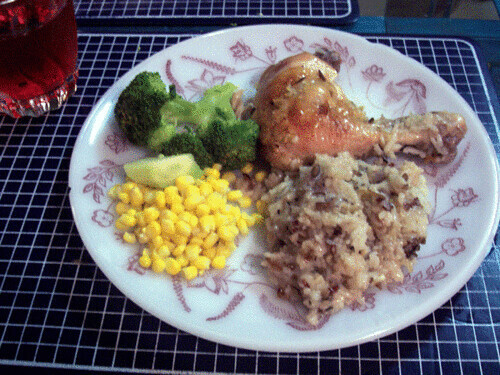 No thawed chicken either… maybe I’ll make this for dinner tomorow night. Brown rice, red rice, wild rice … ano kulay ng wild rice, JMom? 🙂 Pwede intan rice o kaya milagrosa? this will definitely help me out too.